Pooch & Mutt Salmon Oil Omega 3 Supplement offers dogs a balanced, natural source of Omega 3 fatty acids, essential for healthy growth. These essential fatty acids do not occur naturally in your pet's body and can only be obtained through diet. 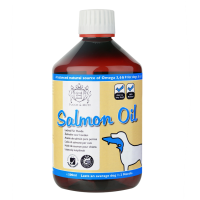 This Salmon Oil supplement ensures your dog receives the Omega 3 and 6 they require to sustain healthy development. Supplementing the diet with Omega 3 has also proven to improve skin and coat quality, cardiovascular health, immune response, cognitive function and joint mobility. Great value for money, it makes my dog eat his food, and he is a very fussy eater.